'West View' - My all time favourite home! My great grand father and my great grand mother built a house in the year 1942. They named it “WEST VIEW”, we are still trying to figure out why they gave an english name to it, though this name has already made a special place in our hearts. Indeed one of the most beautifully crafted houses that I have ever seen in my life. It’s more than 65 years old today. It has a huge courtyard around it, though my father tells me that it was even bigger around 25 years ago, some area around the edge had to be given the government for road widening. The courtyard even after widening offers a well around 35 feet deep, trees of Mango, Peru, Papaya, blue berry, mulberry among fruits and other trees like Ashoka, Gulmohar surrounding it! 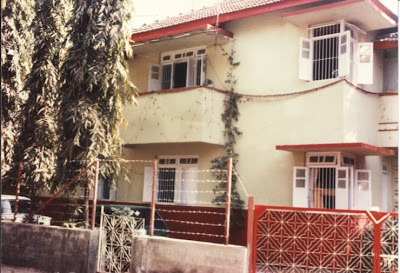 To me till date it has been a treasure land, I was always amazed by the fact that I had a home like no one else had!! All my friends shook their head in disbelief when I described my house to them. They experienced the richness of such houses only at their native place. I was the only one who shared a lovely huge ‘old world charm’ kind of mansion located right amidst the buzzing city life! I stayed there for the first eight years of my life, and then I shifted with my parents & my brother to my father’s company quarters. But we visited our old home almost everyday. It wasn’t far away. In vacations I and my brother would spend most of our time there. My grandparents always insisted that we all cousins stay with them in vacations. We had a gala time, getting pampered by our grandparents, getting to eat all the fruits which were very much grown in our courtyard itself. 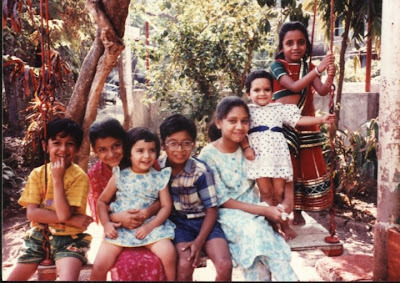 I never remember wearing chappals while playing in the courtyard, though it was rough! Playing chor police, treasure hunt, lagori, dabba aispais, thikkar, carom and cards kept us busy. The courtyard was layered with cow dung in the morning; my grandparents along with others followed this chore every Sunday. It was followed by breakfast of delicious Kanda Poha! The fragrance of the cow dung (maybe there are a few people who hate it, but I love it) was really freshening! And believe me it’s not everyone’s cup of tea, it’s rather a piece of skill! Every tree had a fencing of bricks around it. The bricks were painted with reddish brown colour (geru) and rangoli was drawn around it! The well never went dry or even close to getting dry; we used the water for washing clothes, utensils and a lot of times on a Sunday, a great plan to swim in the well would be made. Some would prefer to be spectators. I was one of them. I loved the splash of water on my face when anyone jumped in the well! Some of the fat ones who jumped were always teased due to the volume of water splashed by them! After a nice swim, all of us were more than ready for a wonderful lunch comprising of aamras (mango pulp) and hot round purees!! Wow!! My mouth is watering even when I am writing this. Those times were about togetherness, fun and carefree souls!! After we grow up everything seems to change, and though we keep feeling bad for it, we happen to be helpless! Now our salient home is about to be demolished and a new tower is going to rise in its place. Though this truth is too disheartening and disturbing to face, it’s also very necessary considering other factors. So this post is my little way to thank my great grand parents, who built such a breathtaking house and to my grand parents and parents who nurtured it to the best of their abilities, till it was in their hand. But the thought that our generation didn’t do anything about it will always make me restless forever.